At Freedom for All Americans, we’re fighting for the day when clear, comprehensive nationwide nondiscrimination protections for LGBTQ people become a reality. However, we know that working toward this reality requires movement at every level of government, including federal, state, and local. In recent weeks, we’ve seen several localities pass LGBTQ-inclusive nondiscrimination protections. Each victory works to build momentum for nondiscrimination protections to be implemented on a larger level — and shows that a majority of Americans believe in protecting their LGBTQ friends, family, and neighbors. 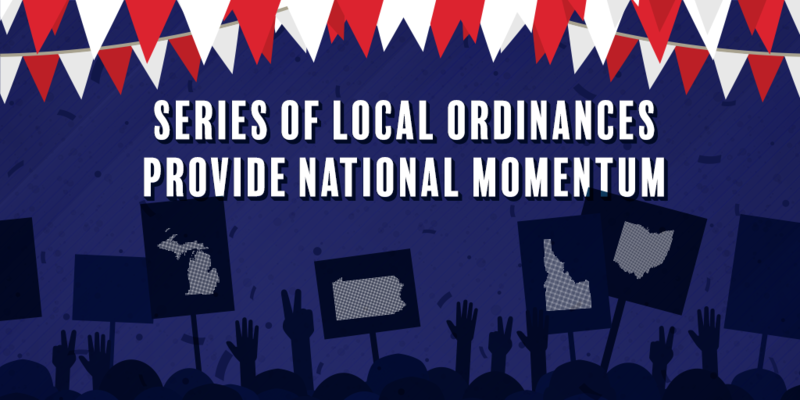 Here’s a look at four municipalities that have passed their own comprehensive nondiscrimination ordinances, all in states without explicit state-level protections. Meridian, ID: A nondiscrimination ordinance passed in Idaho’s second largest city on September 25 by a vote of 4-2, and will cover approximately 96,000 people. Cuyahoga County, OH: On September 25, Cuyahoga County Council voted 8-3 to implement a county-wide nondiscrimination ordinance, which will affect over one million residents in Ohio’s largest county. Cadillac, MI: City council voted 6-1 to pass a comprehensive nondiscrimination ordinance, covering approximately 10,000 people. Ross Township, PA: Approximately 30,000 residents will be covered by the city’s recently passed nondiscrimination ordinance, making it the 52nd city in Pennsylvania to offer such protections. While these recent successes are much to celebrate, the work continues: 31 states still offer insufficient statewide nondiscrimination protections, and legislators in many states have also continued to introduce anti-LGBTQ bills — many of which have sought to discriminate against transgender people in particular. Fortunately, the majority of these efforts have been largely defeated by advocates. This election season will see one of the most significant LGBTQ fights in recent history, with explicit nondiscrimination protections for transgender people up for a vote in Massachusetts. Freedom For All Massachusetts/Yes on 3, the coalition to defend these protections, continues to educate voters across the state about the critical importance of these protections, and how their repeal would devastate Massachusetts’ transgender population. Opponents of the law have made clear that if they are successful in Massachusetts, they will be emboldened to try similar tactics in other states — a #Yeson3 vote is of the utmost importance this November. To learn more about the campaign, click here to visit their website. Even with these battles ahead of us, we take heart in knowing that people in cities and towns across the country, both large and small, are continuing to stand up for LGBTQ people and declare their support for comprehensive nondiscrimination protections. Only through these continued successes can we build the necessary momentum to pass both state and nationwide nondiscrimination protections, which will make full, lived equality a reality for all. To declare your support of nationwide nondiscrimination protections, sign our pledge here.